Larry King and Ben Schwartz bring Larry’s stream-of-consciousness Twitter rant to life with a rapid-fire exchange of #ItsMy2Cents. Ben Schwartz: Oh I love it Larry. Let’s do this. Larry King: No other thoughts. Larry King: I’ve been doing it for years, I used to write it as a column for ‘USA Today,’ for the ‘Miami Herald,’ and now I do it every Sunday on my Twitter, it’s my two cents, I send out 25 items, I just dictate them, and I don’t send them, I dictate them, I used to type them. They just come through my mind, they all have to be one sentence. Ben Schwartz: Okay that’s great. One sentence. Larry King: There’s no actor like Wallace Beery. Larry King: That just popped into me. Ben Schwartz: Cottonelle wet wipes should be loved by all. Larry King: If you put too much butter on popcorn, you kill it. Ben Schwartz: Oh my goodness. I cannot agree with that more, by the way. We can get into big debates on that. Larry King: No you don’t have to agree with it, that’s the best thing about it. Larry King: That’s not the way it works, Ben. Ben Schwartz: I’ve got it, I’ve got it. Matzo ball soup should be hotter than regular soup. Larry King: I’ve never had an affinity for pumpkin pie. Ben Schwartz: [Laughs] Why do pumpkin seeds exist? Larry King: I’ve never read a good biography of Benito Mussolini. 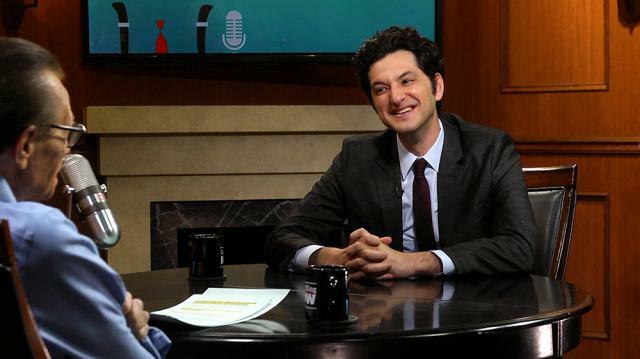 Ben Schwartz: Why do you have a microphone in front of you? Larry King: That makes no sense. Larry King: It’s a fake. Ben Schwartz: That’s what I was saying, that just came into my head. Go, keep going, we’re in it now. Larry King: Like all things, life is a fake. Ben Schwartz: Ooh I like that, I like that very much. Baseball seems boring, but I’ll watch it every now and then. Larry King: Baseball is my favorite sport, period. Ben Schwartz: I know, that’s why I said it. Larry King: And we’re out of time. But I want to tell you this, Ben. In the history of annals, there is and was and will never be, a better duck. Ben Schwartz: [Laughs] Oh come on!